A loft conversion is one of the most popular home improvement projects. It adds a new, functional space to a property. Homeowners convert their roof space into any number of spaces, including bedrooms, home offices, family rooms, gyms and storage areas. In addition to adding space to a house, loft conversions also increase a property's value. Since converting a loft can be a complex task, hiring an experienced builder is often the best way to ensure a good quality end product. Generally, planning permission for a loft conversion is not required. Planning permission is needed when extending or altering a roof space when it exceeds certain limits and conditions. Larger loft conversions that require roof extensions that change the style of the property typically require planning permission. Permission might also be needed when using materials that differ from the existing property, and if the project involves certain side-facing windows, a veranda, a balcony or a raised platform. It is also required if the loft conversion is on a property located within a designated area, such as an Area of Outstanding Beauty or a Conservation Area. Building regulations approval is needed when converting a loft into a liveable space. Applicable building regulations relate to the stability of the structure, the structural strength of new flooring, fire safety, the design of stairs to the new loft, and sound insulation between the loft conversion and living space below. Additional regulations may apply for larger properties with three or more storeys. Some loft conversions may also require compliance with The Party Wall etc. Act 1996, which requires homeowners to provide notice of works to adjoining owners and resolve any disputes before moving forward. One of the most common types of loft conversions is a dormer loft conversion. A dormer loft conversion is an extension of the existing roof. This type of project creates additional floor and head space with one or more new rooms. It also enhances the property design with new features created from extending the roof, often with the use of dormer windows to add the most amount of additional space. A Velux or roof window loft conversion typically involves adding windows to the existing roof in order to improve lighting. Other improvements are also made to create a functional and liveable space. Unlike dormer loft conversions, planning permission is generally not needed although planning regulation approval is still required. Roof window loft conversions are also more affordable than dormer conversions. Bespoke loft conversions can create spaces customised for individual homeowners. These conversions might include adding a roof terrace. Some loft conversions might involve creating a mansard, a French-inspired flat-roof style conversion. Another type of conversion is a hip-to-gable style conversion where the sloping side of the property is changed into a flat gable end. Since these types of conversions often change the outline of the roof and the style of the house, planning permission is typically required. 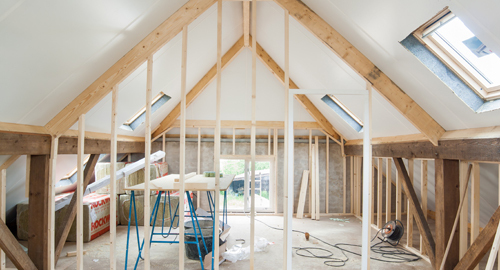 Before starting a loft conversion project, it is important to understand the objective. It is important to understand what the space will be used for since this information will help when drafting architectural plans. Having a plan will also inform what sorts of supports are needed, including electrical and lighting requirements. When adding living space, it is also important to consider enhancing storage facilities and utilities. This is sometimes overlooked when designing new living space in a home. A loft space should incorporate closets and other storage areas in order to avoid putting strain on storage facilities elsewhere in the house. Water tanks and pipes are often found in roof spaces, so it is important to understand where these are before beginning a project. The new space needs hot water and heating, and an existing boiler might not handle additional space. As a result, homeowners may need to upgrade their central heating system, boiler, plumbing or electrical wiring as part of the conversion. A survey should be carried out before undertaking any type of loft conversion. It will also provide specific dimensions for the loft space in order to inform the design of the project In addition to providing information on any risks related to the structure of the loft space and roof, a survey will also determine if there are protected species in the roof space. If protected bats are found in a loft or roof, a licence may be needed in order to carry out work. Before beginning work, the Local Planning Authority should be contacted to determine if planning permission is required. Prior to beginning, it is also important to contact the local authority's Building Control to discuss the proposal and seek building regulation approval. A builder will often seek any approvals and inspections on your behalf. Loft conversions require a lot of work. Hiring a builder with experience in loft conversions will ensure a safe and successful project. A builder will assist with seeking appropriate planning permission and ensure the project meets with all applicable building regulations. A loft conversion requires knowledge of a number of building tasks, including electrical work, insulation, building a staircase and plumbing. If a homeowner does not have building experiences and especially knowledge of strengthening flooring, it is best to leave the project to a specialist in order to avoid problems. A builder will also inspect the roof and determine if the loft is suitable for conversion. When choosing a builder, ask to see past examples of loft conversion projects. Speak to family and friends about any recommendations they might have for similar projects. A good builder will make safety their top priority, with the best ones using scaffolding until the internal staircase is built rather than bringing all materials inside the property. When speaking with potential builders, always have a clear understanding of costs, timelines and how the project will affect the rest of the property. Before choosing a builder, ensure that their vision aligns with your objectives and goals.